The Back to Steiglitz Association Inc. is a local group of volunteers who continue the tradition of the reunion in this historic gold mining town in Victoria to assist in the restoration and maintenance of the historic buildings and surrounds. The biennual Back to Steiglitz Festivall and Airing of the Quilts events in particular help support local projects. Our latest, and possibly biggest, project is saving the Steiglitz State School – currently derelict and in danger of being lost forever. Steiglitz is an old gold mining town located in the Brisbane Ranges National Park about an hours drive west of Melbourne. It is part of the Steiglitz Historic Park including Crown land in and around the township. Today the township is like a glimpse of the past as it is isolated from the modern world with no mains power or water, no mobile phone coverage in parts and gravel roads. 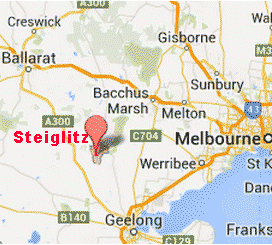 The Back to Steiglitz Association acknowledges that we gather and meet on the traditional land of the Wadda Wurrung people and we pay our respects to their Elders past and present - the Traditional Owners as well as Aboriginal people from all over Australia who have been long-term custodians of the land in this region.